Cooking mashed potatoes for two is not difficult. 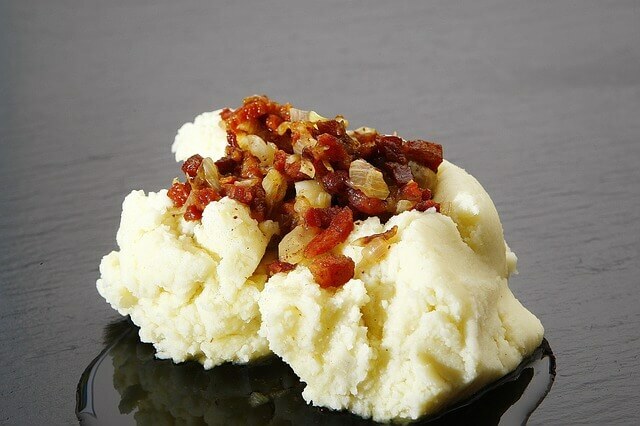 When preparing a casual small meal or a formal holiday meal for two, you may find this mashed potatoes recipe a breeze. The best part of the recipe is that it does not require a masher or ricer. Begin by boiling water. While waiting for the water to boil peel one to one and a half pounds of potatoes, then once peeled cut potatoes into thin strips then place into boiling water. Next, while potatoes are cooking warm a half cup milk, or cream if you want richer potatoes. After potatoes boiled 15 to 20 minutes, drain then return the potatoes to the pan and keep the heat on low. Add one tablespoon butter, or more if it is your preference, then add your dairy choice and cook for a few minutes. Now let’s mash, use a wooden spoon, fork or whisk to mash and stir until the potatoes meet your standards. Making mashed potatoes for two is easy using one large russet potato. Be creative with these potatoes since they can be a versatile blank canvas for tying together a meal in a theme.